For awhile, I sat in front of the computer trying to determine how I was going to approach this post because honestly, I have so much to be thankful for. Do I express my gratitude for the countless number of "little things" that make my life that much sweeter? Or do I aim to be thankful for the bigger things that I'm so privileged to have, like upcoming travels and an education? Should I thank specific people who've gone above and beyond for me, or all those who've graced my life and as a result, taken part in shaping who I've become today? I think ultimately, I'm just going to say thank you. To everyone. For everything. I'm more blessed than most, and I hope I never take that for granted. I'll be signing off for the rest of the week to savor time with family, so I hope that everyone has a most special Thanksgiving and are able to score some sweet deals on Black Friday (but PLEASE don't get trampled or be the trampler!). What are your Thanksgiving plans, people? Love this picture of you!! Happy Thanksgiving! Hope you have a great holiday with your family!! Hope you have a wonderful T-Giving!!! Ah, I completely agree. How do you ever begin counting your blessings? So great to be mindful, however. Savoring is such a good way to approach it. What a great word! Happy thanksgiving! Enjoy the time with your family. aww that vest is super cute! 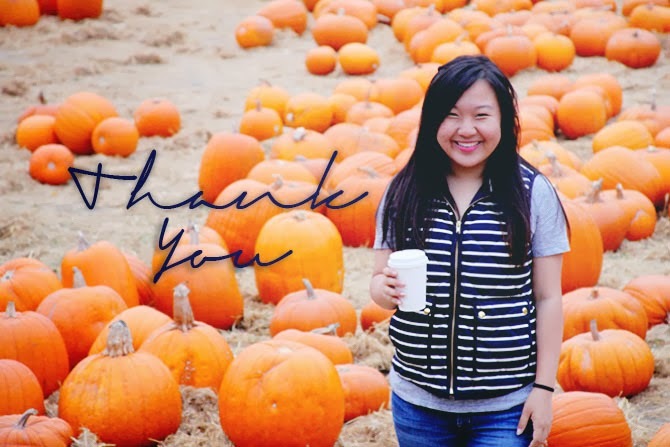 i love it on you.. i heart this adorable fall pic w/ the pumpkins in the back! hope you had a lovely and delicious thanksgiving hon! That's how I felt this year, too, Caroline :) Thanks for visiting ANC and looking forward to reading more from you! hope you had a wonderful thanksgiving.. we didn't celebrate this year. we stayed in our pj's and had a nice meal.. but that was it. the other three days were spent picking paint samples, buying supplies, looking at furniture.. etc. I think I need another few days off.